The trip to the Questura interrupted my tales of hiking in Switzerland. We had unbelievable weather, sunny though chilly in the morning, no rain until the night before we departed for home. We never had to deploy an umbrella or pull up our hoods. Having a full week in Lauterbrunnen afforded us an opportunity to explore the region a bit more than we have in two prior trips. Relative to the other meaning of “afford,” we were able to keep the budget somewhat in check by renting an apartment and cooking breakfast and most dinners. With this plan to travel extensively in retirement, we have committed to cooking more when we travel. After all, we have time. Plus, the food in Lauterbrunnen is rather uninspiring. It’s a cheese world after all: Rösti, Raclette, and Fondue are everywhere you turn. Vegetable options are slim, mostly potatoes and small green salads or coleslaw. 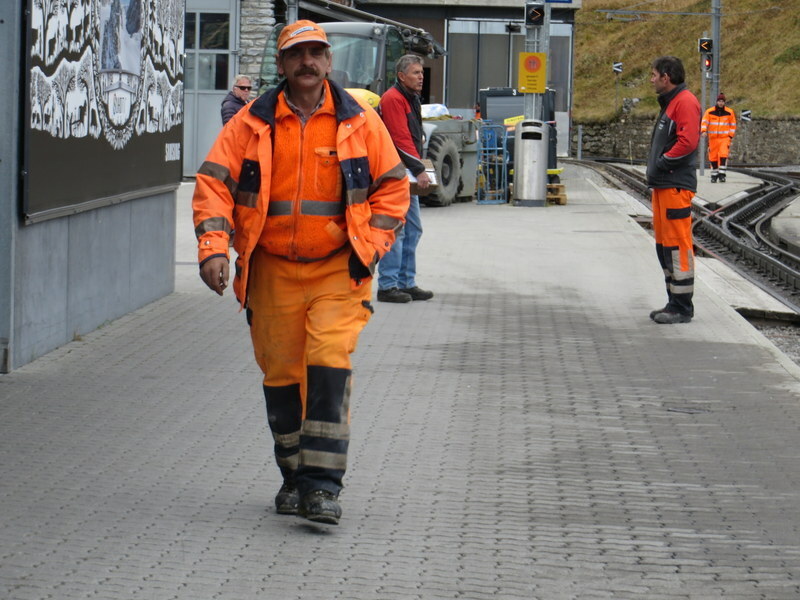 The trains and lifts get pretty expensive, but a Swiss half-fare card coupled with a Berner-Oberland Regional Pass meant we were able to save considerably on transportation during our 11 nights in Switzerland. This is an extraordinary place to visit and hike. We really love the Dolomites, but Switzerland is pretty special too. It is incredibly clean and well-organized although the food and coffee are better in the Dolomites. Which way? 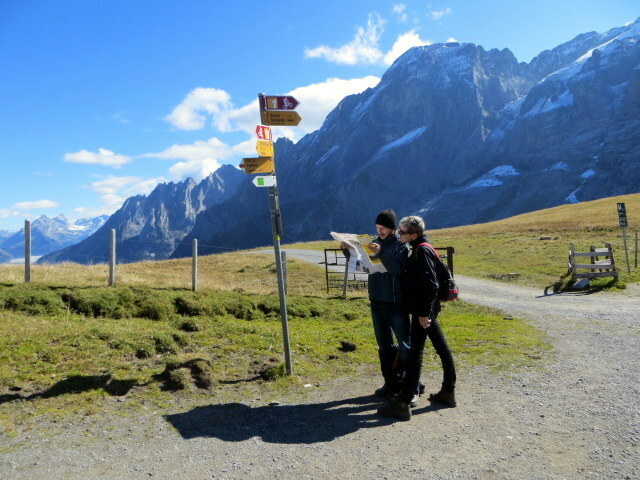 I love this picture Ric took of two hikers standing beneath a way-finding sign looking at their map. Hiking from First to Grosse Scheidegg, that’s the Eiger in the background. Every time we go here we feel like we need to watch “The Eiger Sanction” again. 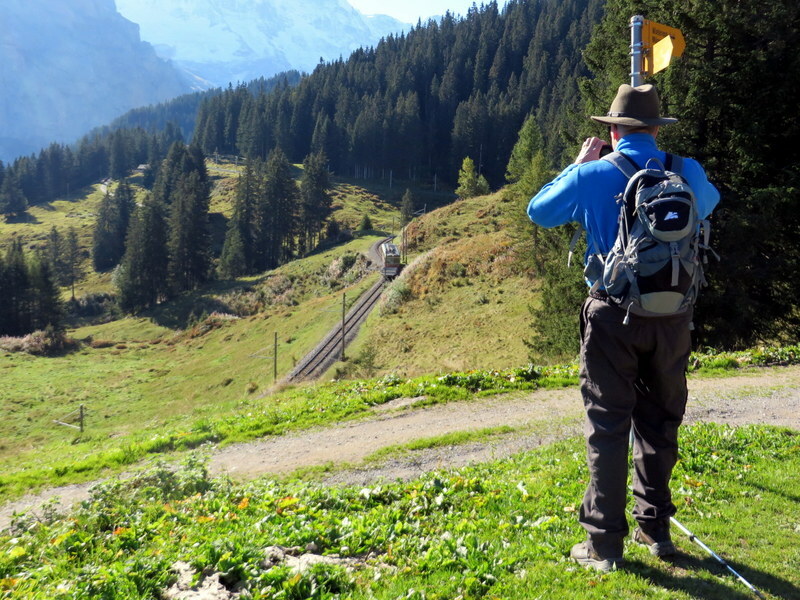 We love this hike from Grutschalp to Muerren along the narrow gauge rail line. 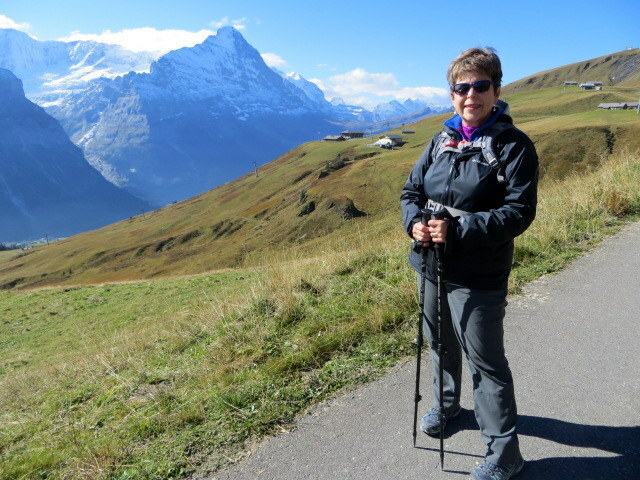 Another favorite hike is from Mannlichen to Kleine Scheidegg. 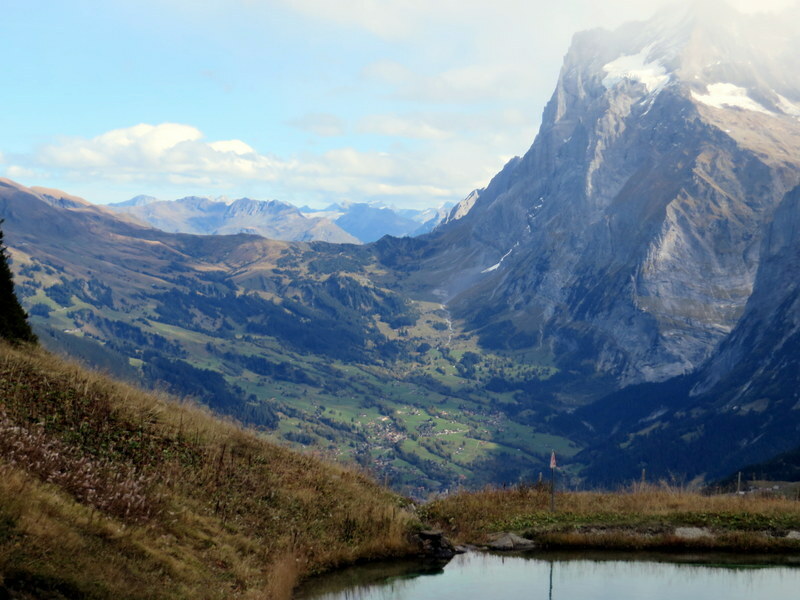 This is a view toward Grindelwald in the valley. My surveillance photo of Ric getting ready for a hike. At a train station, of course. 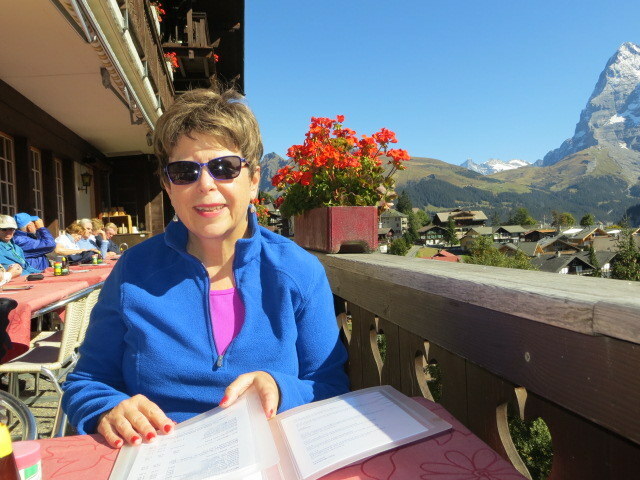 Lunch in Muerren, overlooking the Lauterbrunnen Valley. We did one city day, in Bern. Here, the city center as seen from the site of our lunch above the bear enclosure. 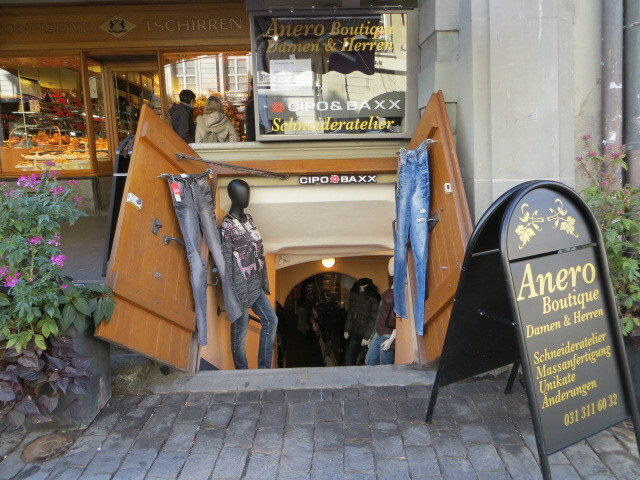 Subterranean shop in Bern. There are many such shops, former storehouses and cellars. 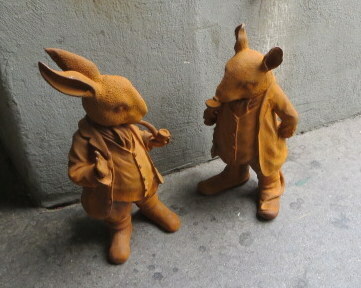 Terra cotta bunny and mouse, Bern, Switzerland. This is the guy we saw with the gun on the train two days before. He works for the railroad. Looking out our back door. 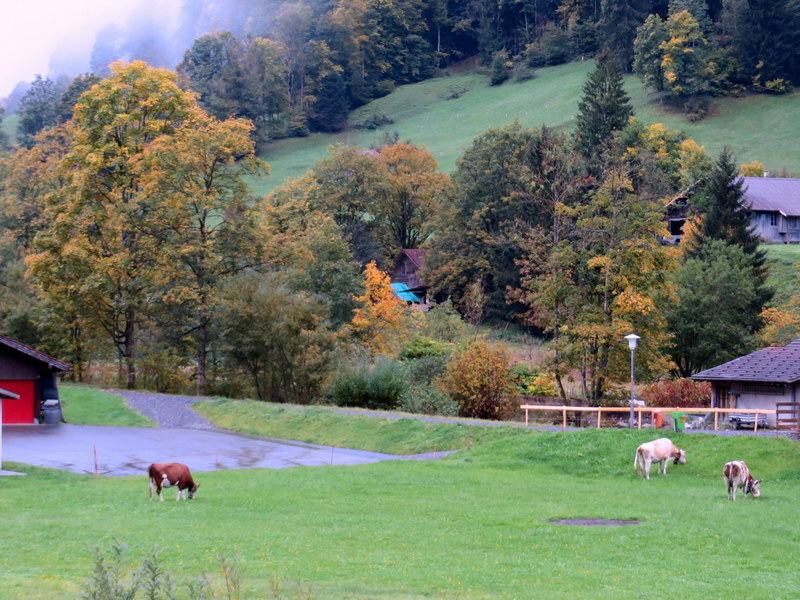 The morning we departed, the cows were put to graze in the meadow behind our apartment. 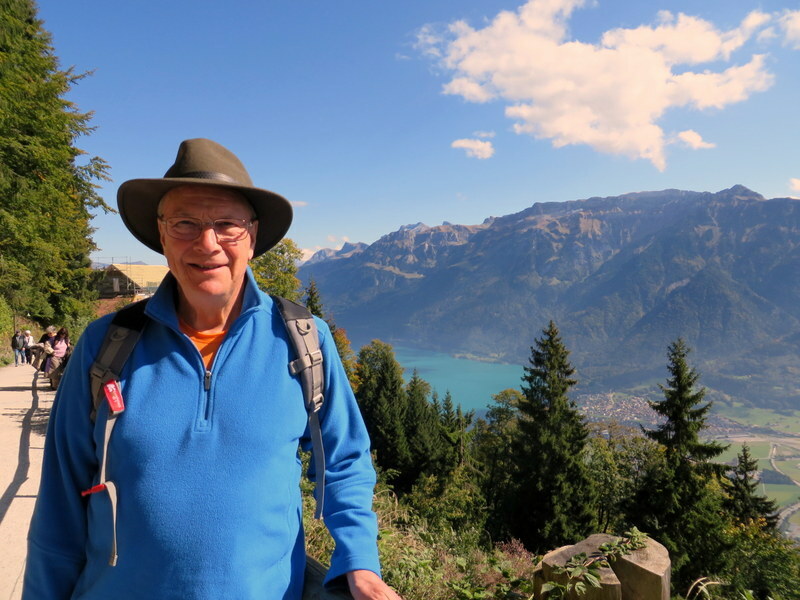 View from Harder Klum to Lake Brienz. Lovely day, difficult hike. 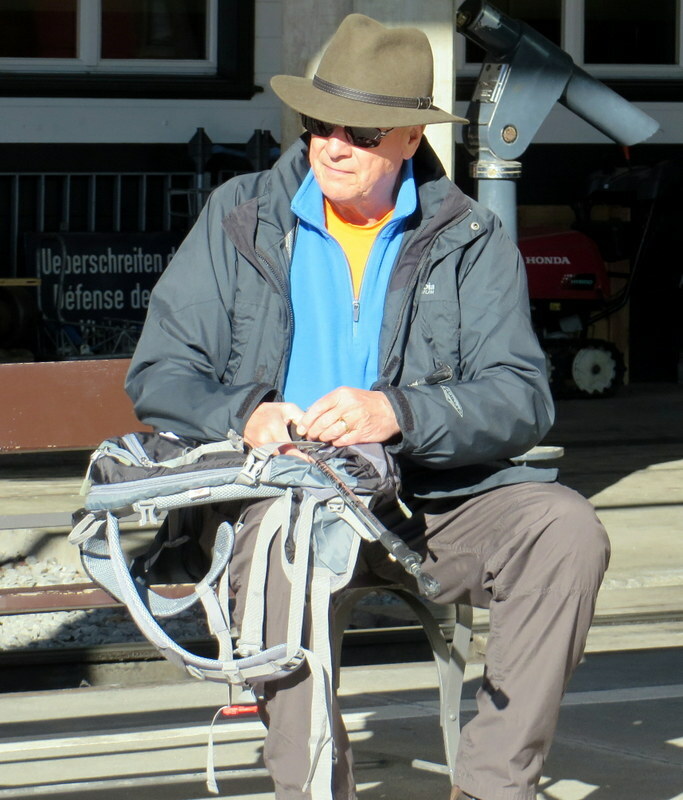 Your pictures brought back great memories of an October long weekend we spent in Lauterbrunnen a few years ago. My favorite picture then was of a flock of paragliders landing off target in a pasture full of curious cows. But that cheese! When we arrived, I thought “we’ll have to take some home to Germany.” After eating stinky cheese in EVERY restaurant dish for four days, I believe I had enough for a lifetime! Enjoying your travels through these blog posts. Loved our years living in Europe. Would go back in a heartbeat. Enjoy it all! Hi Ruth! Sorry to be so tardy in responding. I lost track of comments. We took a zillion photos of paragliders. I had to resist the urge to post them all! Thanks for reading and traveling along! Bern before and YOU ARE THERE! You’re my kind of people for sure. Love reading your adventures. Kim Freed should be visiting you soon too. Marcia, I am very late in responding! Thank you for your nice compliments. Retirement agrees with us. Yes, Kim will be here the 6th. So excited to see her. You giys should come over some time. 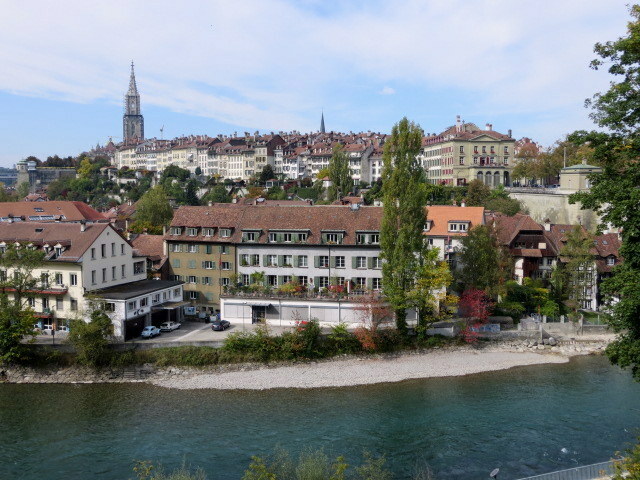 Bern was not busy with tourists, at least not American tourists. One place I have never been is Harder Kulm. Also, we could see the Rothorn from our walking around the Giessbach Falls and we’ve never been there either. Oh well, I guess we have to go back, eh? Always good to have a reason to return! Your photos were very nice. I want that bunny and mouse. We also tend to rent when we travel, as we did on our last trip to Rome. We found in Rome that it was better to eat lunch in, as everything closes down for so long after lunch. We enjoy a siesta too. Yes, we love “la pausa” as well, but on these hiking trips we are seldom back in our digs before 15;30 or 16;00, so lunch in a “rifugio” or restaurant is the order of the day. The late return makes dinner in that much more attractive. What can one say? Just beautiful. Love your hiking pictures. What great adventures. Thanks, Diana! Writing the blog really helps me remember all the great trips we have taken.